Burkina Faso is a semi-arid Sahel country, with a population of approximately 18 million. Almost half (40 percent) of its population lives below the poverty line. The majority of the population depends on one season of rain-fed agriculture for their livelihoods, leaving the country vulnerable to climate shocks. Women, boys and girls under five and elderly continue to be most affected by persistent food and nutrition insecurity, especially in rural areas. As of 2015, Global acute malnutrition is 10.4 percent and chronic malnutrition is 30.2 percent. In 2016, a total of 2.5 million people are at risk for food insecurity. The primary education enrollment rate is 87 percent. While progress has been made to decrease undernutrition and food insecurity and increase access to education, further efforts by the Government and its partners are still required. National and regional insecurity, including the ongoing conflict in northern Mali, threaten political stability and economic development in Burkina Faso. 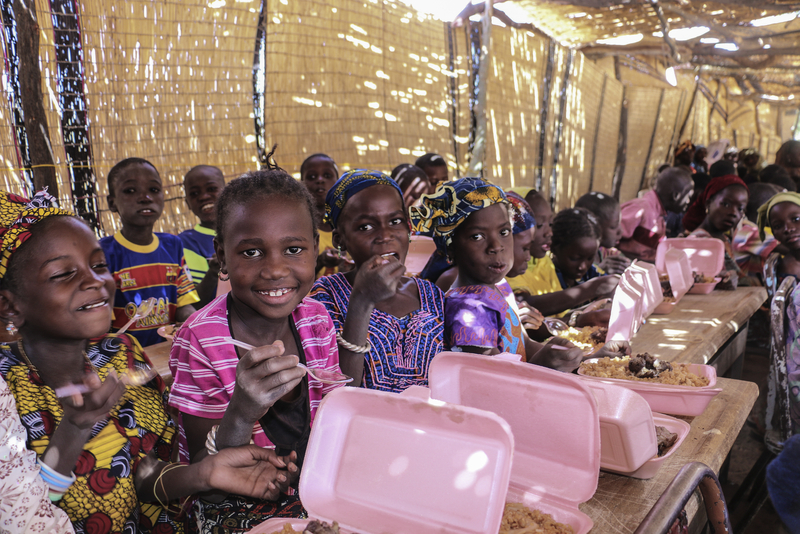 Support to primary education: WFP provided daily school meals to 132,000 children in 955 primary schools in the Sahel region and take home rations to 11,125 girls in the last two years. It has contributed to the drastic improvement of enrolment, attendance and retention in the region, particularly for girls. In addition, a pilot project to introduce dairy products in school meals promotes home-grown school meals, income-generating activities for women and development of local dairies. Nutritional support to vulnerable groups: Through this component, WFP provides food and nutritional support to 12,000 people living with HIV and AIDS orphans as well as Super Cereal Plus rations to 10,000 children in the Sahel region to prevent stunting. Food and nutrition assistance to Malian refugees: In collaboration with the government and other partners, WFP provides assistance to 32,000 Malian refugees residing in two camps in the Sahel region in Burkina Faso. Treatment and prevention of malnutrition: WFP provides treatment of moderate acute malnutrition to 348,100 children under five and 124,000 pregnant and nursing mothers in seven regions with the highest levels of undernutrition and food insecurity. Additionally, 21,000 caretakers of children receiving in-patient care at therapeutic feeding centers for severe acute malnutrition receive take-home rations. To prevent acute malnutrition, 156,000 people in three regions with the highest levels of undernutrition will receive rations of Super Cereal Plus during the lean season. Food Assistance for Assets: WFP supports the creation of small-scale agricultural assets and provides training on improved agricultural techniques and income-generating activities in rural areas of six regions with high food insecurity and malnutrition. A total of 465,000 men and women receive conditional cash transfers under this activity.